Butterflies are Free to Fly: A New and Radical Approach to Spiritual Evolution is a free ebook written to examine how quantum physics and recent scientific experiments are radically changing our understanding of life, our reality, and our spirituality – and giving us a new model for the way our universe works and the practical steps to take toward true joy and excitement and peace of mind. You can download the free ebook in various different formats (including for Kindle, Sony, and other pocket readers) by clicking here. It is also available as an audiobook for free to listen to on any mp3 player. You can download the free audiobook (or listen to it here, now) by clicking here. NEW! And now you can order a printed copy of the book by clicking here. You can read a synopsis and the Introduction by clicking here. You can read the book reviews by clicking here. You can watch all the videos referred to in the book by clicking here. You can read about the author by clicking here. After reading the book and watching the videos, you can leave a comment here?about how this Model is working in your own life. Watch a 5-minute Video Invitation to the Holographic Universe Workshops on YouTube. Everything on this website is free (except for the printed book). We don?t even want your name or email address (unless you want to leave a comment). However, if you found the information in this free ebook and workshop series to be valuable and would like to help keep it free for everyone, please consider donating a few dollars to help offset the cost of website and video hosting expenses, using the button below. 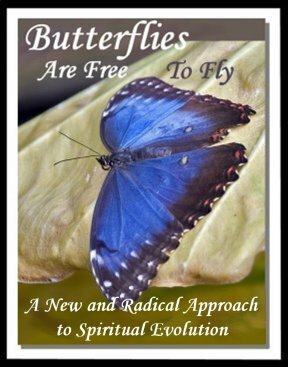 Copyright © 2009 Butterflies are Free to Fly. All Rights Reserved.